Pouparts Junction near Clapham Junction, London, 19th February 1868.
bridge over the London, Chatham, and Dover Railway, and then over a further portion of embankment south of that bridge. then rises 1 in 190 towards the south. the embankment, but off the rails. tender. 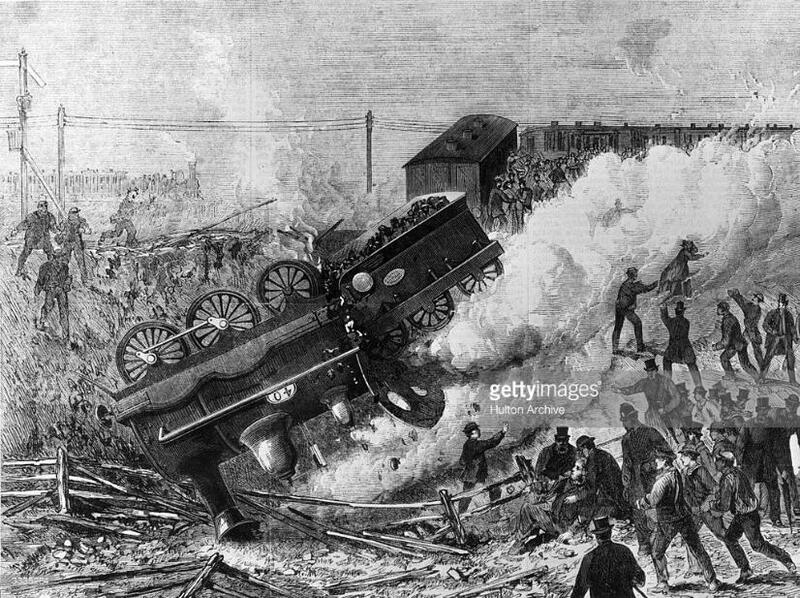 The total damage to the engine and tender is estimated at 60/., and to the carriages at 40/. engine first left the rails he notice some platelayers at work here. across the hand rail with his feet against the fire box; and was shaken. carriages three only have as yet complained of injury. only been running after that operation for four days. mounted, and 1 5/8 ins. where it dropped off to the right of the outer rail. condition of the curve as shown by the measurement above recorded. but also on similar curves at other parts of the line.